My husband and I have been married for almost ten years now, and we have been together for fifteen. For all of that time, I have been the primary cook in the house. So I hope you can understand how surprised I was when my husband complained a month or so ago that I have made all kinds of foods based in my Canadian and British heritage, but I never cooked anything from his German background except the occasional bratwurst. This was the first time he’d requested German food in the fifteen years we have been together. I really wish he’d said something sooner. New cuisine has a learning curve! 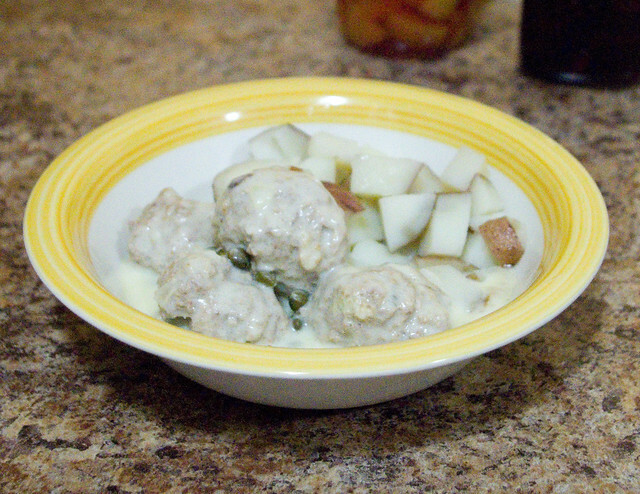 Königsberg Meatballs from page 70 of Grandma’s German Cookbook by Linn Schmidt & Birgit Hamm (2012). Delicious and very filling. Served here with boiled potato cubes. 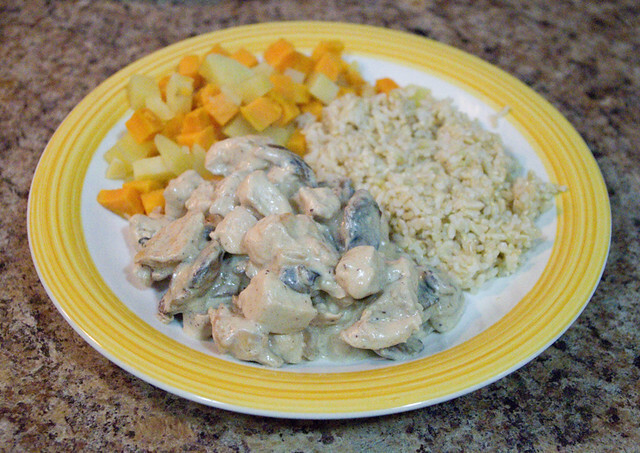 Chicken Stroganoff from page 78 of The German Kitchen: Traditional Recipes, Regional Favorites by Christopher and Catherine Knuth (2013). Quite tasty. I thought stroganoff was a Russian dish, but in this book it was presented as German, so what do I know? Served here with brown rice and steamed white & orange sweet potato cubes. While German Cooking has been a great resource, I needed to read up further. I scoured my local library for German cookbooks and put a whole stack of them on reserve when they weren’t immediately available. I’ve read and reread them a number of times. I’ve tried out a few of the dishes and I think I am starting to get a rough grasp on them. I think the hardest part so far has been finding the proper ingredients. One bread recipe, for example, called for (among other ingredients) spelt flour and malt powder. I was finally able to find the spelt flour in a health food shop, but the malt powder eluded me for some time. I eventually went to a brew-your-own-beer place, which did have wheat malt powder for sale. I never did find barley malt powder, which I’m told is the standard in Europe. Also, sometimes the malt is sweet, and is sold in a syrup that is eaten the same way one would eat molasses here. Is there a powdered version of this syrup, like how you can get maple sugar? If there is, I haven’t seen it. Which kind of malt powder did they mean? It’s probably perfectly obvious to someone who has made this these dishes before, but for a beginner in German cuisine… I’m just not conversant with all the variations of the ingredients. But I am learning! Posted on March 9, 2017 March 9, 2017 by owntwohandsblogPosted in CookingTagged food, main course, traditions.